I began playing Koshan Conspiracy in late 1993 when I was in 10th grade after buying it from Software, Etc. I had a 486/25Mhz back then, with 32 Mb of RAM and a 170Mb hard drive, running MS-DOS 5.0. I finished playing in the spring for 2003 on a PentiumII/600Mhz laptop, with 256Mb of RAM and a 12Gb hard drive, running Windows98. The upgrade in computing power didn't help the game any--I still had to go to MS-Dos Mode to play it. This game was part of a large stack of games I bought in 1993 and was the last one to fall. I would come back to it every year or two, usually starting again from the beginning of the game. Frequently, I would get one step farther along in the plot or have a slightly better understanding of what I was supposed to be doing, but I could never past the guard on Bedhin-6 without being imprisoned and dying. I was finally able to get past this part of the game with the help of a Google-translated French walk-thru (the only walk-thru or hints I ever found on the web). I have since written my own walk-thru for other imprisoned Koshan players out there. I was originally attracted to this game by the description and screen shots. The large world and having so many in-game simulations and possibilities sounded exciting. Also, the high-tech world (a computer implanted in your forearm!) and intriguing plotline sounded promising. I had never played an high-tech espionage game of this sort before. The basic plotline of Koshan is that you are an agent of the clandestine spy agency B.A.T. Equiped with an small computer (your B.O.B.) implanted in your forearm that controls your various cybernetic implants, you are to impersonate a high-ranking citizen on the planet of Shedishan. There, you are to collect a sufficient number of royal deeds to the moon Bedhin-6, which is the major source of the mineral Echiatone-21. You must do this to break Koshan Corporation's current majority of the existing deeds, which gives them control of both Bedhin-6 and the Echiatone-21 market. During the first part of the game, you get to wander the main city of Shedishan--Roma II--looking for deeds. Your contact--another BAT agent named Sylvia--gets you started, but proves to have little information afterwards. From the central city computer AIC you know who has how many deeds. You need to meet with bank managers and senators to try to buy their deeds. You need to break into Carmenta bank to steal some deeds. You need to watch the newspapers (and have a rope) to find more deeds when an advisor to the king is mysteriously slain in his home. And you have to find out how to get on to Bedhin-6 disguised as a praetor. This part of the game is the most fun as it grants you the most freedom. You can wander anywhere and do nearly anything. There's a number of arcade games you can play. There's 4 different kinds of vehicles you can drive throughout the game. You have to make money, and you can do this by stealing from people in the street. You need to constantly feed and water your agent. You can program your B.O.B. with the token-based programming language to do a great number of things. You can try recruiting allies (good luck, unless you know the secret!). You can get wounded and try desperately to "seek medical attention" when your B.O.B. tells you to, only to discover there's no doctor on ROMA II. Only occasionally will your path be blocked by a brown question mark, which means you are missing some item or event to go to this area. There are no clues as to what that item or event might be. Hitting a plot-restraining brown question mark. Eventually your agent succeeds in getting onto Bedhin-6, and there he finds the last of the deeds. He then is captured and imprisoned on returning to ROMA II. You then have to win 3 games at a techno-glad in order to win audience with the king. (You also need a "painstick" from one of the prisoners.) When the king refuses to pardon you, you attack him with the painstick and reveal that he is actually an android put in place by Koshan Corporation. This part of the game only consists of 5 screens and a couple animated sequences. 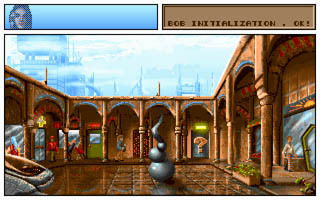 The interface to the game is particularly novel, as it is like a comic book with a number of different panels on the screen. The configuration of the panels changes--sometimes one big one, sometimes 2, sometimes 3 or more. 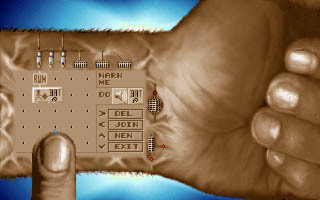 Control is primarily through the mouse. 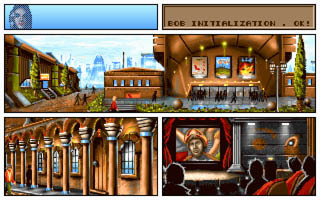 An example of the comic-book like panels. I still think this game is very cool. I must say I was frustrated not being able to figure out how to get onto Bedhin-6. And the second half of the game, while constrained, was not irritatingly so. Since the designers had a specific plotline in mind, I can see why they constrained the end. The most disappointing thing in the whole game was that the final puzzle seemed to have no logic to it. Pressing a button resulted either in death or the end of the game. And the end-game summary was misspelled. It felt like the end of the game was largely an after-thought by the designers. There are a few extra items in the game--things you can get that you don't need to finish the game. But, since you can carry any amount of stuff, this served to add depth to the world. Also, there was a subtle clue that if someone you talk to mentions an item, you'll need to have it at some point. The brown question marks were frustrating. A single sentence on why this path was denied to me would have helped. For example, "You have no motivation to go here" or "You have no way of reaching the ledge from here" or "Your disguise failed because your praetor's card was reported missing." That would have given me enough of a clue to keep searching for the right answer. Despite the small frustrations and a single major setback, I enjoyed the game. I'll may play it again some time "for old time's sake." BAT2: The Koshan Conspiracy. Computer software. Computer's Dream/UbiSoft, 1993 (or 1992? ).